With over 38 years of experience our team are highly skilled in the production of CNC turning, CNC milling, drilling, convention milling, conventional turning, 3D milling, engraving, 3D modular designing, prototyping, CAD/CAM design. All our equipment can meet the demands of some of the most complex designed products to be engineered. 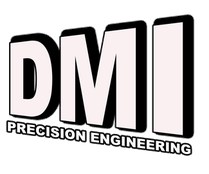 At DMI Precision Engineering we work closely with our clients at every stage of the process, from initial concept to finished design before going into production. We work hard to find the best tooling products and material costs on offer throughout the UK and Europe so that we can offer the best solutions and prices to our clients. Creative thinking inspires great ideas.